Oil Flowing Material Balance (Oil FMB) is the advanced engineering technique published in 2005 by Louis Mattar and David Anderson . Oil Flowing Material Balance uses readily available Well flowing data: production rate, wellhead pressures and the fluid levels. The interpretation technique is fitting the data points with the straight lines to estimate STOIIP and JD. multiple wells producing from the same Reservoir. Note what Oil Flowing Material Balance accounts for the changing PVT properties of the oil with pressure. 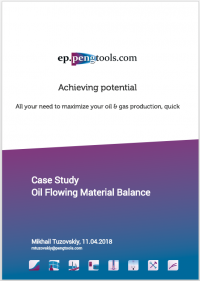 This Case Study demonstrates the application of the Oil Flowing Material Balance engineering technique using the E&P Portal. The Study is based on the oil well from a field in West Siberia, Russia. Save and export the analysis results. All the input data is attached to the Case Study for the reference. ↑ 1.0 1.1 Mattar, L.; Anderson, D (2005). "Dynamic Material Balance (Oil or Gas-In-Place Without Shut-Ins)" (PDF). CIPC. ↑ 2.0 2.1 Stalgorova, Ekaterina; Mattar, Louis (2016). "Analytical Methods for Single-Phase Oil Flow: Accounting for Changing Liquid and Rock Properties". Society of Petroleum Engineers.